My 5 year old has actually been there a few times with his very young Uncle and my mom's youngest sis but I have yet to take him there personally with his younger brother until last week. It was about 4pm and there was a bit of the sun but some area of the playground are quite shaded. 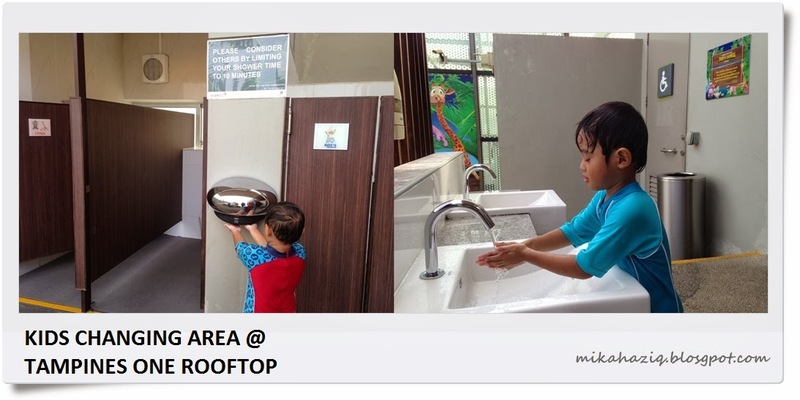 The rooftop at Tampines One shopping mall has both water playground and an outdoor playground (both free) suitable for toddlers and also bigger kids and very kids friendly changing room and toilets. Very convenient. 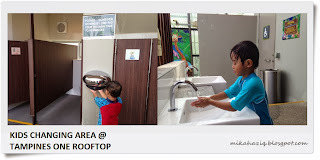 If the weather is bad KidzGo indoor playground (fee applicable) is at level 4. Sadly, this section was closed for maintenance. The water playground is open Tuesdays- Sundays 10 am to 9.30pm and Mondays 4 pm to 9.30pm. It will also be closed if the weather is bad. Some teenagers also like to hang around there but there is a security guard on patrol to ensure that the facilities are used as intended and the teenagers will always be asked nicely to hang out at the open area instead of using the playground that is meant for kids. Which is totally great for me cos if not they will hog the playground for hanging out and the small kids will not be able to enjoy the playground properly. The only thing that is lacking is a halal food court :) but then again if you are really hungry Fish and Co, The Coffee Bean and BBQ Chicken are halal food places available at Tampines One if not cross over to the other side to Tampines Mall for McDonald's. The water playground opening hours. Resepi Asparagus Yang Paling Simple! !